Social Leaderboard: What Drives Outperformance? We’re back with the Media Industry Social Leaderboard, fresh off the presses with February results. For any newcomers, the Social Leaderboard is a ranking of the top 50 media publishers by their effectiveness at driving traffic from Facebook and Twitter. From January to February, social traffic composition was flat, with the average staying at 7%. The gap between Facebook and Google traffic coming in to the Top 50, which had been rapidly closing since November, froze in February with Google holding on to its 30% lead for one more month. Only four publishers in the top 10 improved their social traffic scores this month: NBC (+1.5%) took third place by trading places with Us Magazine (the biggest loser in the top 10 with -3%, now at #5). Break (+2%) and TMZ (+0.5%) leapfrogged the pack of MTV, NFL and MLB, pushing those three back to #8, 9 and 10. But the biggest mover and shaker was Wetpaint Entertainment. 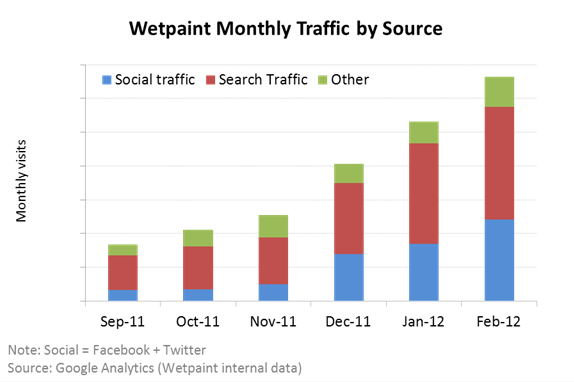 Wetpaint took an even more decisive lead by adding 7% to social traffic composition since January, vaulting it into the elite group of publishers who, based on Compete data, receive more traffic from Facebook than from Google (in good company with People, Yahoo!, AOL, MSN, Fox Sports, and The Post Game). 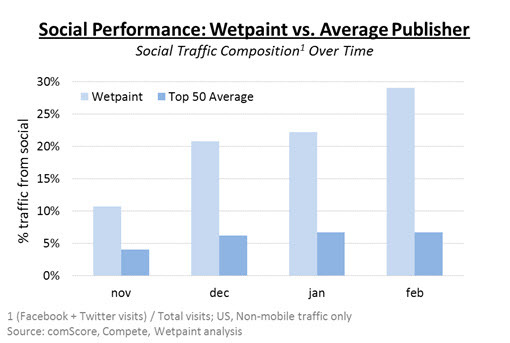 With 29% of traffic coming from social, Wetpaint is outperforming its closest competitor by nearly 2x. Is this a data aberration? Some kind of leap year phenomenon? Let me fill you in on the story behind the 29%: over the last two years, we took a gamble by building a new platform for social media distribution. It wasn’t a sure bet, and not many other publishers were doing it, but we had seen compelling evidence that social was the only way forward for the media industry. We threw all of our time and talent at the problem, building up a fan base while developing and testing and refining new strategies for delivering content through social channels. We collected tons of data in real time about the preferences of our fans, and then we leveraged that insight to personalize and program their newsfeeds. Today, the rest of the media industry is just starting to figure out the value of winning fans and courting likes. But because of our early investment, we’re already two steps ahead – we’re focusing on what to do with our 1.7 million fans. We’re delivering over 1,000 posts a week, each one targeted for the right fan with the right content at the right time. And it’s starting to pay off. A year and a half ago, I called an end to the decade-long obsession with search. I claimed that SEO is dead, and I set my sights on perfecting a strategy for its successor, SMO (social media optimization). Has the success in social come at the expense of search? Could it be that by forsaking SEO in favor of social, we earn more search traffic? Seems perverse. I went looking for an explanation, and I dug up some interesting info: behind content, social signals are the most important factor in search ranking. This is big news for an industry that’s had years of conditioning to believe that link building and keywords are the Holy Grail of SEO. 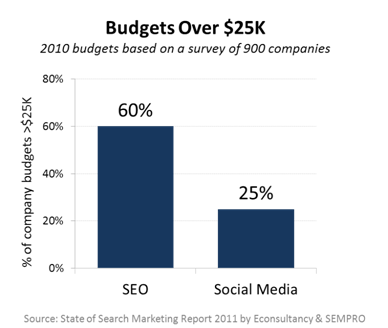 In 2010, 60% of companies spent more than $25K on SEO, while a measly 25% spent that much on social. Publishers: if you have that excellent content in place, put down your old SEO playbook and start investing in social. What does investing in social look like? It means repackaging your content for a social audience, and then delivering it to them at the right time and in the right channel. At Wetpaint, each piece of content gets a tailor-made package (we tweak the title, the timing, the images, even the content itself) depending on its destination. Now go forth, get social, and delight in the search traffic that follows. It’s time again to check our horses and see who’s pulling ahead in the social publishing race! And the race is definitely on – 85% of the top 50 publishers increased their social traffic this month. Until I started charting the incredible growth of social and its impact on the rest of the web, I wondered if it might be more hype than actual paradigm shift. But the evidence is mounting beyond reasonable doubt, and this month’s results point to the continuation of rapid growth. Facebook traffic to the Top 50 grew 9% in January (after growing 17% in December). 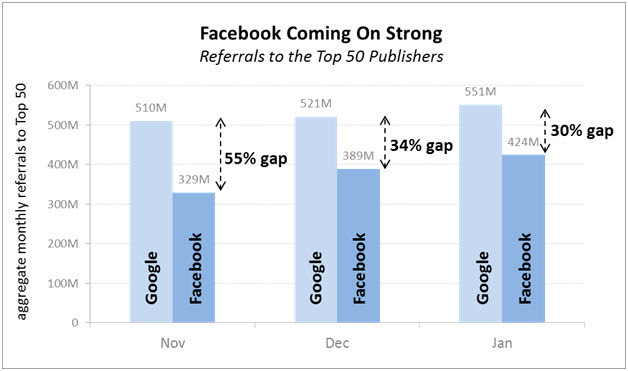 Not only that, but Facebook is closing the gap with Google: The gap between how much traffic Google sends and Facebook sends to the 50 largest publishers is down to just 30%, from 55% in November. At this rate, I expect Facebook to surpass Google traffic to publishers some time this year. Note: This analysis includes portals (e.g. 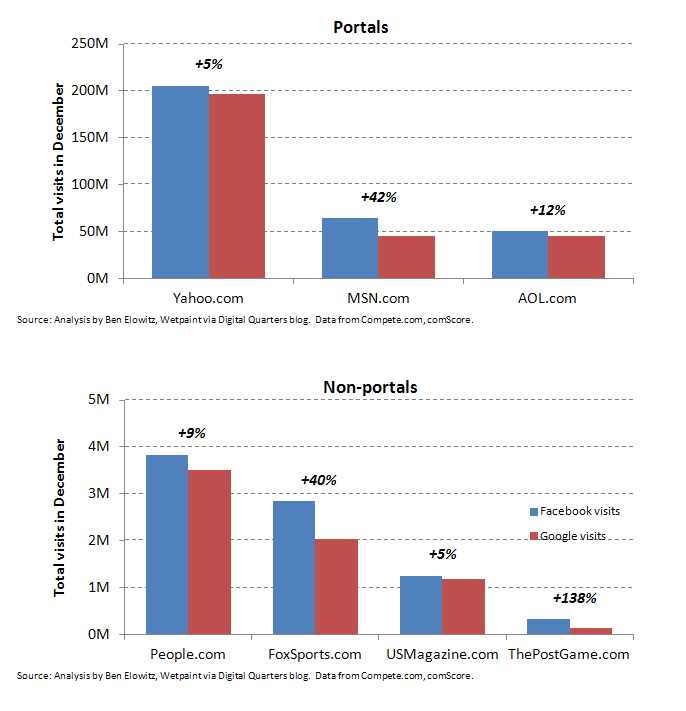 Yahoo), which receive more overall traffic but a smaller proportion of Google traffic than the average non-portal publisher, who might see a larger gap. At the wire it’s Wetpaint Entertainment (with 22.2% of traffic coming from social) followed by People, followed by Us Magazine. Coming on strong on the outside is CBS, pulling ahead of NBC for 4th place by drawing 14.4% of their traffic from social (up from 11.7% in December). Wetpaint Entertainment increased its lead this month, adding 1.4% to its social traffic and widening the gap with #2 People by an additional 0.5%. People and Us Magazine increased their social traffic composition by 0.8% and 0.6%, respectively – just slightly more than the Top 50 average of 0.5%. CBS was the biggest mover by far, adding 2.7% to its social traffic. Ladies and gentleman, place your bets. It’s still anyone’s race, but one thing is for sure: if you’re spending all of your time on SEO and SEM, you’re backing the wrong horse. Alex Weinstein (@alexweinstein) is the Director of Product at Wetpaint and the author of the Technology + Entrepreneurship blog where he explores data-driven decision making in the face of uncertainty. Prior to Wetpaint, Weinstein led technology initiatives in Microsoft Live Labs. How Long Until Social Is A Bigger Traffic Source Than Search? In yesterday’s Media Industry Social Leaderboard, I noted that leading web publishers on the web saw a staggering 17% increase in their social traffic from November to December. These top 50 websites are now averaging about 8 million referrals per month from Facebook. At this rate, the question asked by Fred Wilson and others is: how long until social drives more traffic than search? Based on data from Compete.com, it won’t be long at all. Let’s look at the specifics. When it comes to driving traffic, the gap between social and search is already smaller than most realize. In fact, for every 100 visits that Google sent to the top 50 web publishers in November, Facebook sent 62. By December, it was already up to 73 visits from Facebook for every 100 from Google. At the same time, search traffic to these publishers is stable to declining, with Google referrals falling 0.5% over the same period. So how long until Facebook outranks Google? If these monthly rates of change were to continue apace, Facebook traffic would outrank Google traffic for the top 50 publishers in aggregate by March of this year! Shockingly, Compete.com data shows that already seven of the top 50 publishers get more traffic from Facebook than from Google: MSN, ThePostGame, Yahoo, Aol, People, Fox Sports, and US Magazine. These seven publishers received in aggregate 12% more visits from Facebook than they did from Google last month. And that set of publishers has already grown by five from just a month earlier, in November of 2011, when only MSN and ThePostGame showed more traffic from social than from search. But seven is just a snapshot in time. Based on recent trends, by the middle of this year, I’d expect it to grow to a dozen publishers or more. Regular readers know that it’s only a matter of months before social becomes the most valuable source of traffic for most publishers. And this month’s Media Industry Social Leaderboard is sure to make you even more convinced. So let me get straight to it: From November to December, the amount of traffic the top 50* publishers received from social grew by a whopping 17%. And, when it comes to who is best benefiting from social, let’s just say I’m personally very proud to announce the new leader, which, for the sake of modesty, I’ll do lower down the page. As noted previously, the major changes Facebook announced at September’s f8 event caused a significant blunt in traffic to publishers last fall. Well, the hangover has ended. With 385 million aggregate visits to the top 50 publishers in December, volumes have recovered to pre-f8 levels. 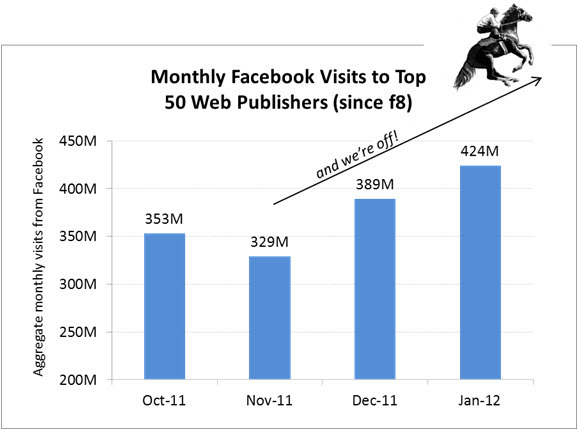 The average top 50 publisher is now receiving almost 8 million visits per month from Facebook and Twitter. And in December, 48 of the top 50 publishers saw increased social traffic levels over November, with these publishers averaging a 2.1 percentage point increase in their composition. At the same time, Twitter has grown in its contribution to the traffic pie, increasing over the course of the fall months from 2.2% of total in September to 3.4% in December. As you know from my prior columns, one of the reasons I’ve published this leaderboard is because we set a goal for Wetpaint to reach #1. What I didn’t tell you previously is the timing: our goal was to do so by the end of 2011. And there is nothing we get more proud of here at Wetpaint than meeting our goals. In December, Wetpaint Entertainment social traffic benchmarked at 20.8% of visits, even as our total traffic was at near-record levels. (Our internal numbers show an even higher contribution.) This outranks all of the top 50 web publishers, besting the number-two by nearly five points. Allow me a moment to kvell: I could not be more proud of the entire Wetpaint team who have achieved this goal. Beyond the amazing results, they have built an amazing social distribution system and playbook that leads the industry. With the virtuous cycle the team has built, we are getting significantly better every month. How did the other leaders from prior months do? People, the previous leader, improved with 16.1% of traffic from social, increasing by 3.9 percentage points even as it fell to the #2 position. In third place now, US Magazine vaulted all the way up from position 19, improving from an average 3.9% to achieve 14.3% of their traffic from social. If you have any idea what drove their results, let me know. As for places #4 and #5, CBS and NBC traded their two slots, with NBC gaining by 4.2 percentage points while CBS gained by only 3.5 points. And all of that activity pushed MTV down to #6, gaining far slower than the others. All the details are, as usual, in the table below. Publishers are clearly benefiting as Facebook delivers on its potential to be not just a network but a social operating system for the internet. In December, we saw the best increases go to the most social publishers (top 10 on this leaderboard), who saw a 4.5 percentage point increase in social traffic composition month to month. Innovation is attracting large audiences on Facebook. In particular, the four publishers driving traffic via social readers have increased their share of Facebook traffic to the Top 50 web publishers by 70%. Yahoo (not included in the 4 just described) has also begun experimenting with social reader tools across select sites and is seeing strong early results as well. In just two months, Yahoo! News US has reportedly seen a 300% increase in Facebook traffic, driven by 1 million “reads” shared daily. We are clearly in the land grab phase on the social web. 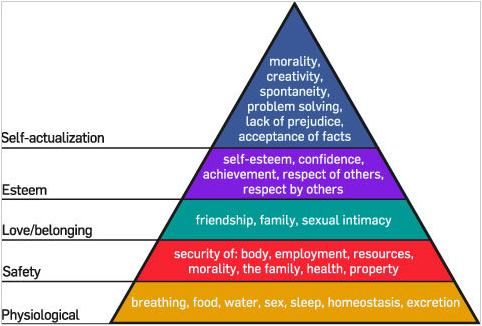 Those who are investing early in social as a top objective stand to gain the most – while others may be left behind. But as my discussions with other media companies show, social is not a simple check-box initiative. It requires complete buy-in from the CEO to transform the organization with social distribution technology and expertise. It can be done, as our own experience at Wetpaint as shown: In less than two years, we have launched a new property and already outranked all of the top 50 publishers on the web. Now we want more. And I hope you do too. * The publishers included in the Media Industry Social Leaderboard are the top 50, as ranked by comScore-reported uniques, whose primary business is web publishing. Once they are selected, data from Compete.com is used to estimate the amount of traffic referred to each by Facebook and Twitter. Is BuzzFeed Multiplying Its Value? Jonah Peretti’s Buzzfeed has been especially buzz-worthy of late, first with a $15.5M capital raise, and more recently via some fascinating brow-raising editorial hires. First, Ben Smith from Politico and then last week, Doree Shafrir from Rolling Stone… and surely more are on the way. It’s a surprise direction to build original content for a site that had been more of a virality aggregator. Why the sudden change, especially considering BuzzFeed has been so successful at acquiring audience? Here’s my two cents: Virality is a multiplier. But like any other “x-factor”, it can only make things valuable relative to how much they’re worth to begin with. A 10X booster can add 9 cents to a penny; or it can be worth $90 by turning a Hamilton into a Franklin. BuzzFeed is among the best on the planet when it comes to this kind of multiplication. And when you’re that good, it only makes sense to start working on the base rate. That means beyond building buzz, the company needs to build a premium brand to attract premium advertisers to its core product and audience. In media, the best way to make a strong brand that attracts high dollars to begin with is with outstanding content. I’ve been fascinated to see that at Wetpaint. We now see more than 12 million uniques monthly: nearly 6 million on our user-generated wiki platform; and 6+ million more on our premium Wetpaint Entertainment property. They both have great virality that helps them draw audience. But the original editorial in Wetpaint Entertainment makes the advertising worth even more – and it’s an even more valuable business model. Premium content plus social distribution means a high base, and a high multiplier on the business model. And it’s the perfect combination for a successful business model. Congratulations to Jonah and team for all the success they’re having!